Oh man, sorry guys. I forgot to post last night. Gongson Chun Gi, who had been watching the pond with his daughter on his knee, paused for a moment. He then retrieved his hand, which had been stroking his daughter’s hair, and thought. Children always manage to stab people with questions like this without thinking about it. Adults can’t get anxious, especially at times like this. They can’t try to change the topic, either. Gongson Chun Gi soon returned to his normal self, and smiled. Gongson Ahri thought a bit. Uncomfortable? Sure, she knew that she was different from others, but she didn’t know if that made her uncomfortable. After thinking for quite some time, the girl shook her head and spoke. Since she never had a mother in the first place, she wasn’t sure what the difference between having one and not having one was. Gongson Ahri didn’t answer her father’s random question, and hesitated a bit. Gongson Chun Gi felt something ominous when he saw that. A feeling that parents feel. That’s what he felt. Gongson Chun Gi immediately lifted his daughter high up in the air, and stared at her in the eye. He looked straight into her daughter’s beautiful emerald eyes, and spoke. Gongson Ahri replied with a face filled with fear. From a young age, Gongson Ahri feared dragonflies quite a lot. She was afraid of the dragonfly’s unique faceted eyes. Young Gongson Ahri nodded vigorously, enough to visibly shake her pink cheeks a little. Gongson Chun Gi then threw a direct question at his daughter. Gongson Ahri stayed silent for a while when she heard the question. She then slowly swallowed her spit out of nervousness, and spoke just about when Gongson Chun Gi’s patience was about to run out. Monster? Gongson Chun Gi’s face stiffened. The thing that he was most worried about had finally happened. Gongson Ahri paused a bit, then nodded. When Gongson Chun Gi’s face stiffened even more, Gongson Ahri spoke in a worried tone. Gongson Chun Gi felt his daughters tiny hand rub against one of his cheecks, and sighed deeply. When he did that, the thing that was about to erupt out of himself slowly subsided. Right. This wasn’t something that could be solved by getting angry in the first place. Children are honest, and straightforward. That didn’t go for just Gongson Ahri. All children were like this. To children who were like that, Gongson Ahri’s unique, beautiful looks must’ve looked quite strange. He was able to understand with his mind, but his heart couldn’t accept it. Gongson Chun Gi was able to shrug off most things without batting an eye, thanks to training his mental capacity for long periods of time. But when it came to things like this, it seemed he, like many others, became a normal father. Gongson Chun Gi didn’t respond to his daughter’s worried voice. That was because he felt like he would swear if he opened his mouth now. But unexpectedly, his chaotic mind became organized relatively quickly. This was a chance. A chance to organize everything at once. Gongson Chun Gi put on his usual face of relaxation again, and smiled. When Gongson Ahri looked at her father with eyes as big as saucers, Gongson Chun Gi stroked her hair and smiled mischievously. Gongson Ahri, who had been observing her father carefully, asked a question with a serious face. Gongson Chun Gi inwardly smiled when he saw his daughter’s serious face. Gongson Ahri shook her head. Her father was the strongest man on earth. He was a man who could fight the world on his own. When Gongson Ahri was looking at her father with eyes full of respect, Gongson Chun Gi lowered his voice and began to whisper. When Gongson Ahri began to whisper, too, Gongson Chun Gi brought his mouth next to his daughter’s ears and spoke. When Gongson Ahri began to blink her wide eyes in surprise, Gongson Chun Gi put his finger up into the sky and spoke. Gongson Ahri tried to say something about her father’s nonchalant act. But before she could, Gongson Chun Gi ruffled her hair, and said something. 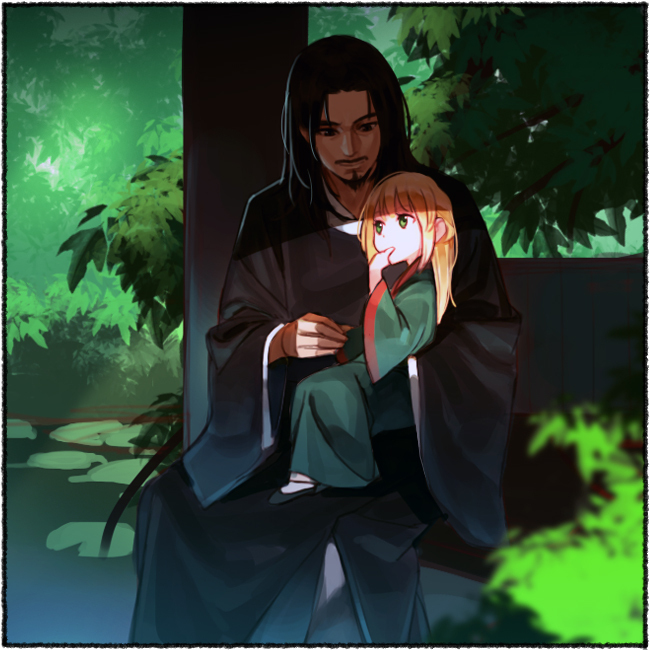 Gongson Ahri didn’t say anything, and just tightly held onto her father’s hand. Cho Ryu Hyang stared at Gongson Ahri. Gongson Ahri, too, stared at Cho Ryu Hyang. The two didn’t avoid their gaze, and looked into each other’s eyes for a while. They were looking at each other as if they were having a staring contest. The one to look away first was, unexpectedly, Gongson Ahri. She had never looked at someone in the eyes for so long, save Gongson Chun Gi. After all, everyone whose eyes met with hers was quick to look away. She didn’t know why they were doing that in the past, but now, she could see why they looked away. Once you look at someone straight in the eye, it feels like your mind can be read by the other person. Gongson Ahri sighed in relief, and asked this question with a calm face. When she looked away, she felt a little calmer than before. Cho Ryu Hyang wrinkled his brows a little bit, and answered while looking at Gongson Ahri. He had heard from Um Seung Do that he didn’t need to pay respect to anyone in the church, but this person here was still Gongson Chun Gi’s daughter. How should he respond? His answer became short without him realizing it. Thankfully, Gongson Ahri didn’t get offended by his attitude one bit. Gongson Ahri repeated Cho Ryu Hyang’s name several times quietly, and grinned. Cho Ryu Hyang quickly turned away when he saw that. Watching the girl made him feel a little weird for some reason. Gongson Ahri, who had been grinning till now, clapped her hands and spoke. When Cho Ryu Hyang nodded, Gongson Ahri became a little amazed. She knew about it. She knew how much her father worked to find a disciple. Gongson Chun Gi’s standards for picking someone was high. Perhaps a little too high……. The boy that her father, her father with really high standards, chose was right here. Gongson Ahri quickly began to observe Cho Ryu Hyang with sparkling eyes. When Cho Ryu Hyang saw this, he too became a little interested. He began to use the Faultless View of The World. Gongson Chun Gi looked at the people in front of him with a unenthusiastic face. Ju Sang San, one of the eight guardians, replied immediately. No matter what happens, he would always be on the Pope’s side. As Gongson Chun Gi seemed a little reluctant to go, Ju Sang San immediately sided with him. But Gang Chang, who was making the report to the Pope, quickly spoke. Guardian Wu, who had been watching this from the sidelines, said this. When Gang Chang heard this, he quickly apologized. Gongson Chun Gi looked at Gang Chang quietly. The man in front of him had business sense, and was talented in many things. But he just had too much attachment regarding traditions and whatnot. Even if he was really attached to traditions, however, Gang Chang would never pester Gongson Chun Gi this much. There definitely had to be some other factor at hand. Gang Chang couldn’t reply immediately. Gongson Chun Gi looked at the troubled man in front of him, and sighed. Gang Chang bowed down immediately. Gongson Chun Gi seemed uninterested. But unlike what the Pope had said, everyone’s face in the room went stiff. They all knew. They all knew how accurate the monk’s prophecies were. They weren’t afraid of her power, but they all had to admit that her prophecies were something that couldn’t be taken lightly. Soon, everyone had a worried expression on their face. Everyone here was extremely worried about the Pope’s health. He was, after all, the strongest Pope in the history of the church. Not only that, Gongson Chun Gi had a strange power that just made people gather towards him. To them, Gongson Chun Gi definitely was someone they didn’t want to lose. When even Ju Sang San changed his attitude carefully like this, Gongson Chun Gi’s face twisted. When Gongson Chun Gi began flexing to show off his bulky muscles, Guardian Wu and Guardian Ju both sighed. Gongson Chun Gi rolled his sleeves back down, and stood up unenthusiastically. He was going to get outside. Gang Chang hurriedly said something when he saw this. When Gang Chang said this with a desperate tone, Gongson Chun Gi sighed. Gongson Chun Gi hated doing anything troublesome, but he didn’t want his subordinates to worry about him. And come to think of it, he had something that he had to settle with that granny. He had been putting it off for such a long time, because it was just bothersome. Gang Chan just made a happy face. When he heard the monk’s prophecy, he tried to make the monk tell him the way to prevent the Pope’s death, but she just wouldn’t talk. She would keep saying that she’d only talk when the Pope came. Because of that, he came all the way here to request the Pope to meet her. Gongson Chun Gi began to walk towards the place where the monk resided after commanding his subordinates. Like mentioned earlier, the Heavenly Demon Church was a very religious group. From the past, the people of the church believed in a mythical being known as God (神). The sun and the moon. Before the Pope known as the Heavenly Demon came to being, the official name for the Heavenly Demon Church was the Church of the Sun and Moon (日月神敎). It was a religion that worshipped the sun and the moon. But after the Heavenly Demon appeared, the church changed completely. The church began to move into a new world. From there, the church had a big contradiction. From a long time ago, the church had a Pope that represented God. But there was also someone who held an equal amount of power as the Pope. The Pope represented the absolute power of the sun, and the Oracle (神女) represented the God’s voice, or the moon. She was a very special existence. Every year, she would take on the soul of god (神託) and make a prophecy, and every year, she would perform two big ceremonies. Because of that, the Oracle had as much power as the Pope. But when the Heavenly Demon became the Pope, everything changed. The Heavenly Demon didn’t worship the sun and the moon. Instead, he just decided to change the whole religion itself so that everyone would worship him instead. He himself became a living god. And he had the right to become one, too. He had destroyed enemies several times bigger than them, and created the Ten Thousand Great Mountains by himself. From then on, the church’s name changed to the Heavenly Demon Church. Thanks to that, the Oracle’s authority went up in the air. But no one really questioned that for the last few centuries. There were no problems until Gongson Chun Gi became the Pope, at least. But when Gongson Chun Gi became the Pope, this logic just shattered to pieces. The coronation of the Pope. When Gongson Chun Gi became the Pope, this was the first thing he said. And in front of everyone in the church, he just took the Oracle’s staff and turned it into find powder. After saying that, he took off the Oracle’s symbol of power, the crown, and spoke. That was what he had said. And on that day, the Oracle turned into a simple monk. Gongson Chun Gi stood in front of the door of the building where the Oracle was in, and stroked his chin. What kind of a face would she have? That granny didn’t come out to any of the ceremonies for several decades after the incident. He thought the granny lived well on her own alone, but was he thinking of things too simply? When Gongson Chun Gi waved his hand, the door in front of him opened silently. On the other side, he could see an old woman standing politely. Gongson Chun Gi and the Oracle. The meeting between the two, the two known to have a bad relationship with each other, started more peacefully than one would think. ….get stronger cho ryu hyang—! And i wonder what he’ll see about that girl! thanks so very much for all your hard work, super looking forward to the future!!!!! Man, that was kind of harsh though. So much is happening this is very interesting! This prediction…could it be that gongsun chun gi’s daughter will marry cho Ryu hyang?